The Magic Pony was my favorate animated fairy tale when I was a kid. An old Russian film, it was first made in the 1940s then remade in 1977. While put on VCR in the 1990s more recent dvd versions replaced the original music with pop songs that really ruined it. The original is now up on You Tube. 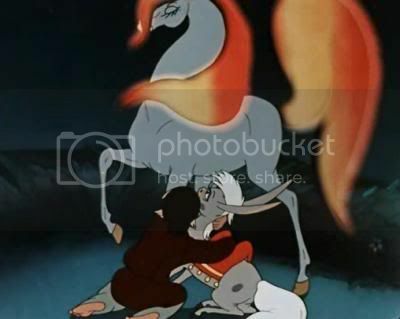 Possibly one of the inspirations for My Little Pony this movie is based on the legend of The Fire-bird, The horse of power, and the princess Vasilissa. I especially love the explanation for crop circles being fairy horses. The original 1940s and Russian versions can be found on Youtube as well. Here the Fairy Horse Queen gives Ivan the titular pony in return for freeing her.reminds me of the Sun Queen. And here is the link to the movie.